We’ve all been there – our furry best friend snuck a snack from the kitchen cabinet again wreaking panic and most likely leaving a mess. It is widely known that chocolate, grapes, and chicken bones among other human foods are harmful to dogs, but what if your dog gets into your stash or eats cannabutter? The THC that we all know and love is poisonous to most domestic pets. Whether through direct ingestion, second-hand smoke or the consumption of foods (edibles) containing THC, your pet could experience moderate to severe toxicity. Depending on the size and age of your dog, and type of exposure, marijuana poisoning can put a serious strain on the liver, lungs, muscle fibres and nervous system. Symptoms can begin between 5 minutes and 3 hours after consumption and typically result in lethargic behaviours, alternatively it can cause hyperactivity and anxiety. Despite being an anti-emetic substance, THC can cause your pet to vomit so be careful that your dog doesn’t asphyxiate from its own excretions. 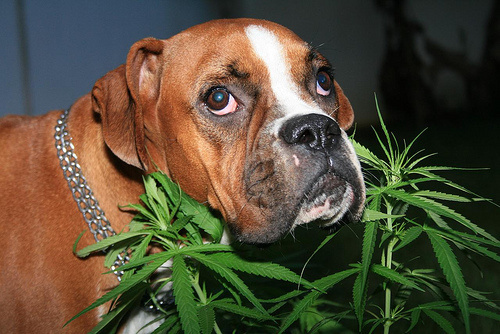 According to The Denver Post dogs love the smell and taste of marijuana despite its toxicity. Particularly dangerous are butter and edibles containing butter as dogs are naturally attracted to fat-laden products too. Depending on how much your furry friend consumed, inducing vomiting may be the solution. Before your dog starts to experience symptoms (ideally within 30 minutes), inducing vomiting is encouraged. Go to your vet for vomit-inducing drugs or activated charcoal that is used to treat poisoning. Beware that vomit should detox the system but asphyxiation is possible so watch your pet closely. Inducing vomiting can be expensive and not to mention scary. If symptoms are unclear and very little was consumed, the best antidote is to make them comfortable and leave out lots of water. Watch your dog for the next few days to make sure the condition doesn’t worsen and hide your stash. Take home message: if you’re looking to lift your dog’s spirits, take him to a new dog park, visit the neighbor’s dog or give him a good belly rub instead. Don’t be fooled by those puppy-dog eyes, once they’ve had a taste, they will like it and they will ask for more, so stash the hash!